← Postcodes freed in 2010, OS to follow..? This Christmas I finally bit the bullet and treated myself to a shiny XBox 360. Ostensibly this was so that I could experiment with console development, but mostly I have used it to play Gears of War. In a slight departure from what I usually talk about, I thought I’d quickly jot down how I got the wireless controller to work with my Ubuntu XBMC media PC. The wireless controller provides a slightly more usable remote than my iPhone (which must first be unlocked making quick pauses impossible) or rather flaky wireless keyboard, so hopefully this will be useful to someone. My media PC currently runs Ubuntu Karmic with XBMC. To begin with you will need to install the XBox kernel driver (already installed on Karmic). Most importantly however, you will need to get yourself a XBox wireless gaming receiver for Windows – which I got included with my second controller. Xbox controllers do not use standard bluetooth, so you can’t just pair in the normal way using your existing hardware. I used this keyfile as a starting point. Download and save it as ~/.xbmc/userdata/keymaps/Keymap.xml (note case). 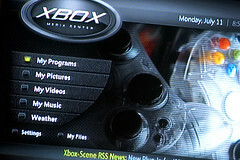 Find out what your computer thinks the controller is by looking at the output from: cat /proc/bus/input/devices – you want a "Name" that says something like "Xbox 360 Wireless Receiver"
Replace all occurrences of "Microsoft Xbox Controller S" with this value. At this point if you start XBMC it should respond to the controller. If you are lucky this is all you will have to do, however for me I had to mess around with the key bindings a bit since the example keymap file didn’t match my controller exactly. If this happens to you there’s not much I can suggest other than to bind one key at a time, restart XBMC and see what button that maps to then repeat until all your keys are mapped. I’m sure there must be an easier way that I’ve overlooked, feel free to comment below! For what it’s worth, here is my modified (but somewhat incomplete) key file which has largely sensible bindings. Hack away to get it working how you like.